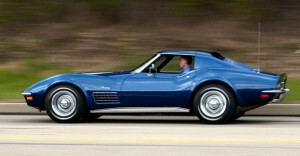 7DEE5.COM - Restoring The 1975 Corvette! While owning a Corvette (1975) is a great feeling, I must admit. There are certain trials and tribulations that the owner of such an American Beauty must experience. Decisions as to where to save money and where to indulge in spending at the cost of the restoration project. I have decided since the engine has been somewhat modified, that I am going to restore this vehicle, but I am not going to attempt a full factory restoration. I am hoping to have a few Corvettes within the next few years, and I have decided that I am going to make this 1975 Corvette as nice and pleasantly eye appealing as I can. There are a few reasons for this way of thinking. After further inspecting the vehicle when I received it, I quickly realized that the rear-end of the body of the Vette was a 1980 rear-end. I also realized that while the front end and the nose of the 1975 Vette was an after market purchase (true 1975 after market product), and not properly installed it was going to be a costly event to repair. In addition the vehicle had damage to the front headlight housing unit, as well as the wheel base area, and the front end of the vehicle was not properly secured and or fastened. This is when I decided that to make the vehicle somewhat visually appealing, and save money to the tune of about $1500.00 it was going to be more costly effective and better serving of the vehicle to purchase a front end of a 1980 Corvette, the car would then be appealing on the exterior to about 80% of the car. The 1975 rear window and housing would remain. So this is the next step in my restoration process. I will be posting the pictures as soon as I install the front end. So the next plan is to install the front end which I purchased it for $700.00 the front end is immaculate. It has an operational headlight housing unit, well attached, as well as the lower grill and additional parking lights. The hood is very good, and the next step will be to paint the vehicle. This will leave the interior project, as well as the cleaning and detailing of the engine.